How can Dutch development organisations adequately prepare themselves for different future scenarios? And what can they do to realise their desired future? These were the central questions of the future exploration of the development cooperation sector initiated by The Spindle, the innovation platform of Partos - membership organisation for development cooperation - in collaboration with Perspectivity and Sprockler. The Future Exploration started in november 2017 with a Sprockler inquiry. More than 100 anonymous professionals working in development cooperation shared their experiences that predict something for the future. Their stories were collected through Sprockler. From this, relevant trends and insecurities were distilled and used as input for the transformative scenario planning project that followed. The stories and the ‘story of stories’ can be read and listened to here. Based on the four scenarios we visualised ‘A future we want’. A regenerative society with care for social needs and planetary boundaries. 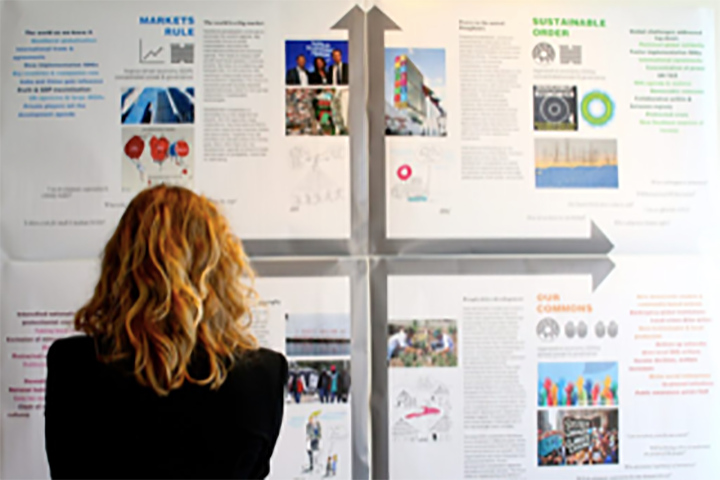 Read the final report with the four scenarios, ‘A future we want’ and strategies for Dutch development organisations.